According to the information on the xda website rooting for the idol is supported but rooting for the star is not. Yes I confirm tested by me and 100% working my model is 6010x but I'm sure working with 6010D dual sim version and other Alcatel models because all is similiar by hardware and OS. Working on my Alcatel 6010x with version 1.53. You're lucky man! I have ......F5.P ROM (android 4.1.1) and Framaroot don't working. Error # 8. I have an alcatel 6010D, version F5.P and with the frameroot 1.53 version I get an error 8. Ill wait for a newer version of frameroot the alternative looks a bit complicated. new version 1.60 available check at the end of post working on more devices. Kubo, I tried 1.60 but it doesn't work on 6010D (dual SIM). Also tried the tutorial at http://alcatelstar.blogspot.com/2013/07/tutorial-how-to-root-alcatel-star-6010x.html#sthash.f9Vkxagp.dpuf but to no effect. SP flash gives red line and YELLOW line in step five and then green circel for OK. Still, when I try reboot in CWM recovery mode with Vol up / On-of button combo, I don't get CWM mode. After 20 seconds it restarts again in normal mode. What is it that I'm overlooking? Hope your German is up to speed, but this manual (Anleitung) works like a charm. You can probably manage with google translate. i can't root. both vwesion error 8. 6010d. i tried factory reset. still no go. i also tried the pc way. there is no red/yellow line appear or green ok download button / % 0. drivers successfully installed. 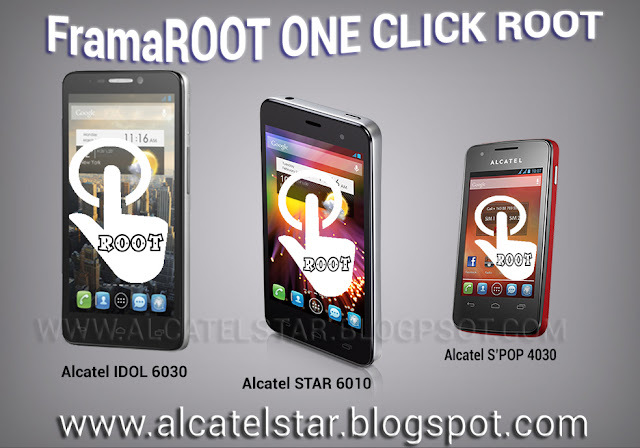 Framaroot not working on Alcatel 6010d reported and tested from me. So ok drivers installed on your computer but may be not loaded. Try to change usb mode to media device (when you plugged usb cable to computer)then back to usb mode all necessary drivers will be installed and once reboot your phone on plugged usb then try again to flash recovery. Does this work on alcatel one touch xpop dual sim? Thanks. I have alcatel one touch 6030x. I follow the step and it says Congratulation. The device has root access. But when i checked the About my phone in settings it doesn't have the Baseband version.